^ Li, J.-X. ; Schieberle, P.; Steinhaus, M. (2017). 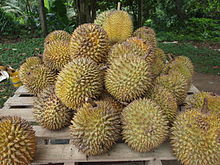 “Insights into the Key Compounds of Durian (Durio zibethinus L. ‘Monthong’) Pulp Odor by Odorant Quantitation and Aroma Simulation Experiments”. J. Agric. Food Chem. 65 (3): 639–647. doi:10.1021/acs.jafc.6b05299. PMID 28024392.